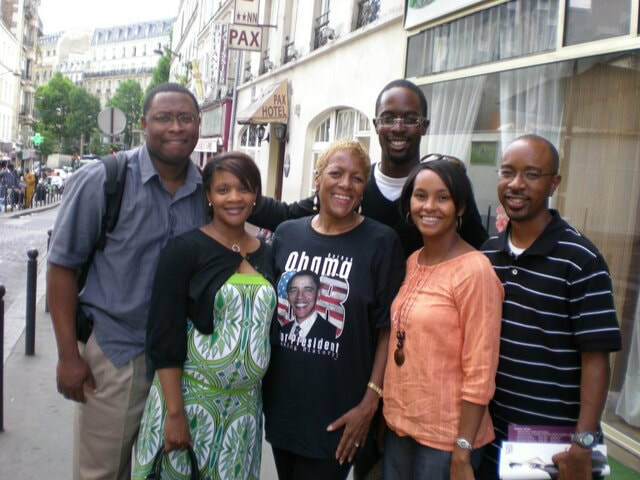 Our BPT guests are given detailed directions to meet us at 10:00am at a quaint restaurant near the Arc de Triomphe for their Black Paris Orientation! We then stroll over to the Arc de Triomphe, where your guide tells of the first great wave of African Americans coming to Paris in the 1800s. We describe the exploits of Black soldiers who distinguished themselves on French battle fields during World Wars I and II and the Champs Elysees Mansion where Thomas Jefferson and Sally Hemings came together in 1787, the beginning of a 38 year relationship. A short bus ride takes us to beautiful Parc Monceau to follow in the footsteps of Frederick Douglass, Dr. W.E.B. Dubois, Henry O. Tanner, Mary Church Terrell, Ida B. Wells, Carter G. Woodson, Countee Cullen, Bessie Coleman, Langston Hughes, and Mary McCloud Bethune. We stroll two blocks to stand before the monument recognizing France's abolition of the African slave trade in the West Indies and recalling the exploits of Napoleon's most famous Black general. Steps away, another statue is dedicated to the General’s son, Alexandre Dumas... the most famous French writer in history. A third statue, recalls the literary achievements of his son, the dramatist, Alexandre Dumas. With the Haitian Consulate overlooking this square, you’ll hear the story of Toussaint L’Ouverture, who led the successful 1791 revolt ... making Haiti the first free Black Republic in the new world. Another bus ride takes us past the building where author Dumas lived, then past the church dedicated to the African Saint Augustine -- a founder of the Catholic Church! Next we’ll see the Church where Josephine Baker was given a state funeral April 15th, 1975. We’ll pause at Place Concorde where the guillotine took the heads of thousands during the French Revolution, and where the US Embassy is headquartered. Place Concorde is home to the oldest monument in Paris today, the African Obelisk .... an astronomical device used to chart the sun and the stars at the Temple of Thebes in Luxor. The two-thirds day tour ends at 3:30pm. For those taking the full day tour, we’ll hop the blue 42 bus to ride past the famous Olympia Concert Hall, where Black American Rock&Roll and R&B stars have performed since the 1950s. It’s the French equivalent of the Apollo in Harlem. Next stop, Opera Garnier! African American greats in the world of operatic and classical music have commanded this stage since the 1800s. Next, the blue 42 bus takes us north to Barbes-Rochechouart in the 18th arrt, and a finger-licking “late lunch” with locals from Mali, Senegal, or Cote d’Ivoire. Even if you've never tasted African cuisine before, Chicken Yassa (lemon-onion dish from Mali), Beef Mafe (beef in peanut sauce from Mali), Fish Thiebou Djene (rice and fish from Senegal), Atthieke (a couscous-like side dish made from cassava) served with either fried fish or chicken and Aloko (sweet fried plantains from West Africa). The food will have you licking your fingers and your plate! You’ll be served the traditional West African drinks: Bissap, mango juice, ginger punch and if we’re really lucky, juice from the Baobab “Tree of Life” that tastes like a pineapple-banana smoothie! After our late lunch, we'll stroll through the Marche in "Little Africa"..... like a quick trip to Dakar, Accra or Abidjan. For the very hearty, your tour ends with mint tea and beignets in La Goutte d'Or. THIS IS WHERE THE FULL DAY TOUR ENDS about 6-6:30pm and we direct our travelers back to the Champs Elysees or to their hotels. A detailed TOUR CONFIRMATION GUIDE is sent to confirmed BPT guests once they have scheduled and paid for their tour. It provides crucial, money and time saving tips, our favorite restaurants, jazz clubs, night clubs and information designed to help you hit the ground running BEFORE your Paris arrival. **Tour itinerary is subject to variation due to seasonal or vacation closure of venues/restaurants. Interested In Nightlife? Let Black Paris Tours introduce you to famous and historic jazz clubs. nightclubs, concerts and cabarets!! Cancellations received 4 days or more prior to tour are fully refundable. Cancellations received less than 4 days before tour are refundable, minus a 20% administrative fee. Requests to change date of your tour are subject to availability. No refunds for same day cancellations. Instead we offer a transferrable voucher that can be used by you or anyone you designate for up to two years! Cancellations received 7 days or more prior to tour are fully refundable. Cancellations received less than three days before tour are nonrefundable. Any changes made to private tours are subject to an administrative fee of up to 20%. Late arrivals and no shows are nonrefundable. Black Paris Tours is not responsible for any incidental expenses you may incur such as non-refundable flights or train fares.